A South Valley resident for 30 years, Economou manages a small farm and has been a longtime activist with the South Valley Alliance. She's treasurer of the Ciudad Soil and Water Conservation District and president of the Rancho de Atrisco/Armijo Acequia. A lifetime South Valley resident running for re-election to a second term, De La Cruz has worked in local government for almost 30 years, including 14 years as the director of Bernalillo County Parks and Recreation. Kirtland is responsible for the disaster, says Economou, and the County Commission should examine options for putting more pressure on the base for proper cleanup. He’s “absolutely” concerned about the issue, but De La Cruz says he’d take a “soft approach” to addressing the environmental hazards. “Beating up on Kirtland won’t make any difference.” He wants to work with federal delegates to secure the funding he says the cleanup will require. Like many political outsiders, Economou's glaring weakness is an inability to detail exactly how she would be effective in office. But such pragmatism is acquired through experience. 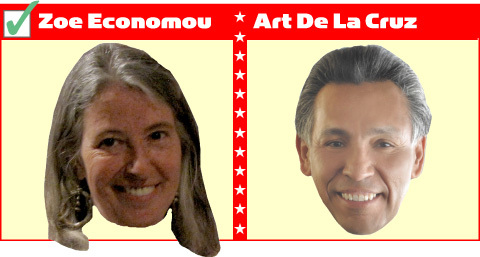 What is clear is that Economou would be a voice for environmental preservation and sustainability on the commission. Her strong stance on sector development plans shows that she respects the district's grassroots. She acknowledges that an expanding and land-hungry metro area means change for the South Valley, and that wise long-term strategy builds upon—not over—the assets of a community. Economou's emphasis on thoughtful development rather than development, period, is a better fit for the ecologically and economically vulnerable district. Art De La Cruz is a polished, poised and well-spoken politician with obvious passion for serving his district. His interview responses are detailed and mostly substantive. It's also clear that he has the energy to marshal support from those across the aisle. He knows how to get things done. This could turn out to be both an asset and a liability to his district. His decision to extend public money to the Las Estancias retail/commercial project further polarized residents when questions were raised about the legality of the grant application. It was a test of his priorities, and it made De La Cruz appear willing to bend over backward (and bend rules) for developers at a cost to the community.